New for 2017, the Speed and Strength Midnight Express Jacket can be thought of as a more refined version of the Under the Radar Mesh Jacket from Speed and Strength. In addition to the 'fierce' mesh found on the Under the Radar Jacket, the Midnight Express Jacket also incorporates a stretch material for increased flexibility and comfort. The jacket also comes in new color combinations, including a high-visibility colorway. Thankfully, the Midnight Express jacket retains many of the features that made its predecessor such an attractive option: Removable C.E. approved shoulder, elbow and spine protection, waist and sleeve adjusters, a YKK zipper and reflective trim. 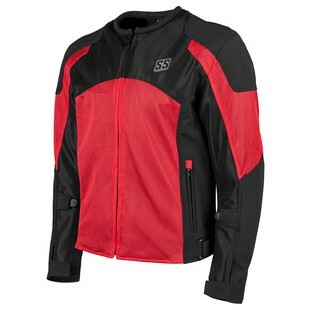 The Speed and Strength Midnight Express Jacket is a perfect hot-weather option for the rider who wants the bells and whistles of a more technical jacket in an affordable, casual and refined package.